China is well behind when it comes to backing the yuan with the amount of gold that Europe and the U.S. can back their respective currencies with, according to Michael Lombardi, lead contributor to Profit Confidential. Lombardi reports that, when China implemented its most sweeping measures to make the yuan more open to the world in 2009, it simultaneously announced its most sweeping measures when it came to gold bullion. Lombardi’s recent Profit Confidential article, China’s Gold Rush, looks into the connection between the Chinese currency and the country’s demand for gold. In 2009, China ordered its miners to no longer export any gold bullion. 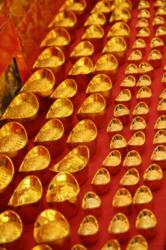 China is the largest producer of gold bullion in the world; 350 tonnes per year. This 350 tonnes yearly is now making its way to the vault of the People’s Bank of China. Lombardi highlights the fact that, over the last few years, the Chinese government has implemented new measures to make its currency—the yuan—an open currency to be used by investors globally. “The People’s Bank of China has given every indication that China wants the yuan to be considered on level with the U.S. dollar and the euro,” says Lombardi. Of the roughly 2,800 tonnes of gold bullion supplied to the world in 2011, Lombardi believes that China is on the hunt for most of it, to back the yuan. “In 2009, China purchased four tonnes of gold bullion from Hong Kong. In 2011, China purchased 46 tonnes of gold bullion from Hong Kong, an 11-fold increase,” says Lombardi. Lombardi strongly believes that China wants enough gold reserves to back the yuan, in order for the yuan to be taken seriously on the world stage.